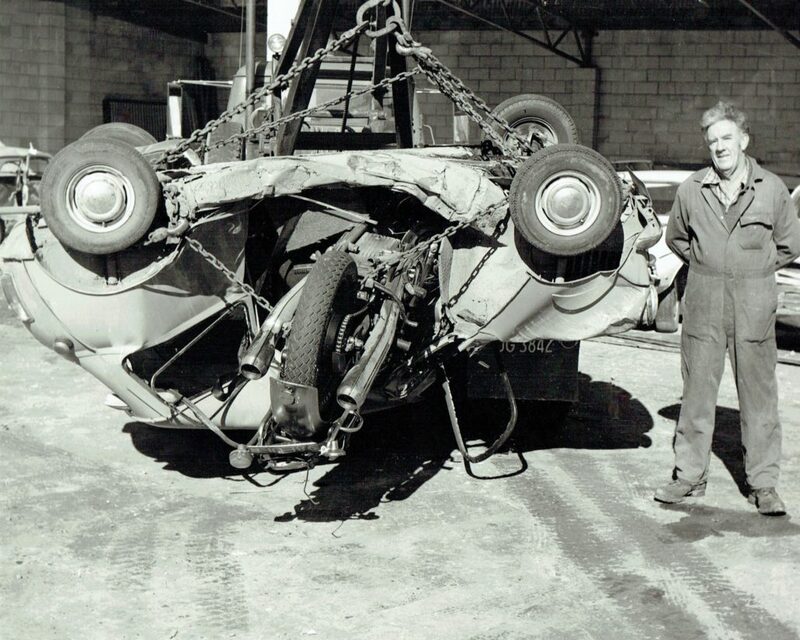 As far back as Huck McCready can remember, he wanted to end up either driving a tow truck ….or a transporter. He sits at a desk overflowing with piled up paperwork and a computer that looks like it doesn’t get much use and tries to explain it: “I’ve always liked towtrucks – I dunno why. Maybe I didn’t have one when I was a kid or something…wasn’t breast-fed or something.” He laughs heartily – even though his Mum Inez might not appeciate that one. Huck is a big bloke – with a big laugh too. But he’s not big on words. So don’t expect him to wax lyrical about how he’s fulfilling all his boyhood dreams. How he was born into this life. You just know he is. Even now, at the age of 54 and the owner of a business that runs a couple of trucking companies and a big engineering mechanical repair shop, huck still gets to drive some of his 16 towtrucks and transporters. Appropriately for a big man , it’s using the big gear that he enjoys. Always has been. These days, it’s the flagship of the Rowe Motors towtruck fleet – a 2002 450-horsepower Isuzu that’s fitted with a heavy-duty Century 9055 underlift, boom and body built by Miller Industries in the United States. 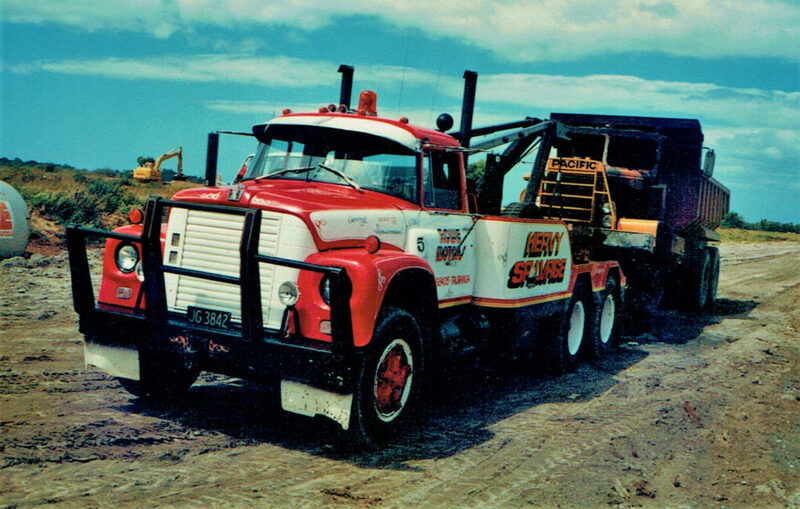 Back in 1970, when he started work for “the old man” (his Dad Bruce McCready) as a 16 year old fresh out of school, it was salvaging trucks with one of the company’s three towtrucks. With a special dispensation allowing him a heavy truck licence two years early, he immediately went to work driving either a 1936 Chev, a ’42 Chev or a seven-tonne petrol-engined TK Bedford. 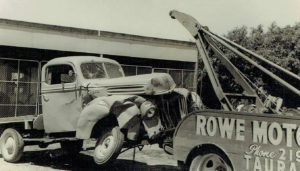 He was the third generation to join the family firm – Rowe Motors having been started by his Grandad, Bill Rowe, in 1946. It was a pretty basic place – “an old wooden shed, with a dirt floor,” recalls Bill’s daughter (and Huck’s Mum) Inez. A year later Bill hired a young bloke he’d previously worked with in the workshop at the local GM dealer. That was Huck’s Dad, Bruce “Pop” McCready – who ended up marrying the boss’ daughter! “That brought him job security straight off!” says Huck, laughing. They added Atlantic petrol pumps and built a new workshop, partly timber milled out of some of the Norfolk Pines that had been growing beside the rented Rowe family home, behind the garage. In a similar do-it-yourself manner, they put two towtrucks on the road. The ’36 Chevy was built out of a truck that had been doing the Oropi cream run, with a wooden body added and a power winch they built up from a Ford Model T diff. Given the name Ronald, Huck got his nickname as a youngster, when – clad in a pair of bib overalls his Dad had bought for him – he was busy in the workshop, chipping and wirebrushing rust off the chassis off the ’42 Chev then being rebuilt into a towtruck. A regular customer, Paddy Lewis, called in on his way home from a fishing trip, plonked a straw hat on young McCready’s head and announced that the kid looked just like Huckleberry Finn. Frome then on, even his own Mum called him Huck. Bill Rowe bowed out of business in 1962 leaving his son-in-law to run the business. 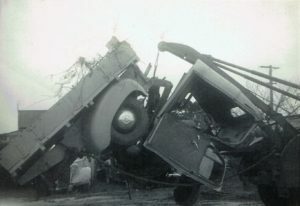 Pop McCready became known as THE towtruck operator on the area. She reckons he was so reliable that, despite other operators starting up in opposition, the cops automatically kept calling Rowes. That suited the 16-year-old just fine – particularly since he got to drive the towtrucks straight off: “Oh yeah – King of the Road. It was a good feeling.” Mind you, he points out, he had already driven trucks for quite a bit. I used to ride with the Wealleans spreader guys, because their depot was based at Rowe Motors when they first came to the Bay of Plenty. “I used to hook up their trucks and trailers and back them into the fert works for them. So really I could drive probably by the time I was 12. They’d get a flat paddock and they’d open the gate and say ‘go on boy spread that.’ I had a lot of fun. One thing that hasn’t changed in the Rowe Motors business is the studied aviodance of getting involved in panelbeating – thuse maintaining independence that has served it well in terms of relationships with the local panel shops. “So we worked nights and days and weekends and when he came back it was parked out-front – painted but not signwritten. Yeah – he was quite surprised,” says Huck with a hearty laugh. The international was a much needed step ahead, he reckons: “The towtrucks needed to get much bigger because the trucks were getting bigger. And, you know, whenever you even looked at a hill in the old TK Bedford – even though it never ever run out of guts (and it should have!) – it made you think. Call us now on 07 578 8405 or Email us.